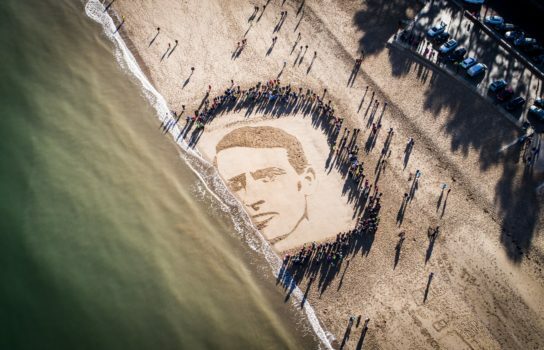 TENS OF THOUSANDS OF PEOPLE GATHER ON BEACHES AROUND THE UK FOR DANNY BOYLE’S ARMISTICE DAY COMMISSION. On 11 November, tens of thousands of people took part in Pages of the Sea – a commission by filmmaker Danny Boyle inviting people to gather on thirty-two beaches around the UK for a nationwide gesture of remembrance for the men and women who left their home shores during the First World War. The work marks the culmination of 14-18 NOW, the UK’s arts programme for the First World War centenary. Over XXXX people experienced the project online, watching the activity on the beaches via social media. Colwyn Bay saw 6000 members of the public engaging in a series of community-led events commemorating the men and women who left their home shores during the First World War. A large-scale portrait of Hedd Wyn, designed by sand artists Sand In Your Eye, was drawn into the sand and washed away as the tide came in – representing a small selection of the millions who gave their lives to the war. The portraits featured across the thirty-two were chosen by Danny Boyle to represent a range of stories – ordinary people who gave their lives to the War effort, from doctors to munition workers, Privates to Lieutenants and Majors. A number of the portraits were of notable war poets, who translated the experience of war for those at home. Many were from the regions or communities they were depicted in, with others from towns, cities and international communities not featured to show the scale of loss. In addition, the public were asked to join in by creating silhouettes of people in the sand, remembering the millions of lives lost or changed forever by the conflict as well as adding family names or names from their community which were also washed away by the tide. The project’s Resource Centre at Porth Eirias was a hub of activity throughout the day with the public able to watch drone photographs and video of the beach portrait as well as contribute to the Memorial Wall and participate in post-card embroidery. Poetry workshops contributed to a recorded soundscape that also included English and Welsh readings of Carol Ann Duffy’s poem. 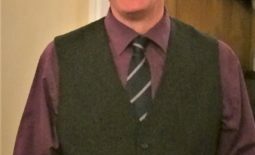 Staff and resources on hand to help people trace information on relatives that fought in the First World War alongside numerous books on the War and on Hedd Wyn, the subject of the sand portrait. Ceramic plaques, copies of WWI ‘Death Pennies’ recreated by local schoolchildren were also exhibited.